After 525 years, the traditional literature recounting the history of Columbus’s epic voyage and first encounters with Native Americans remains Eurocentric, focused principally—whether pro- or anti-Columbus—on Columbus and the European perspective. A historical novel, Encounters Unforeseen: 1492 Retold now dramatizes these events from a bicultural perspective, fictionalizing the beliefs, thoughts, and actions of the Native Americans who met Columbus side by side with those of Columbus and other Europeans, all based on a close reading of Columbus’s Journal, other primary sources, and anthropological studies. The drama alternates among three Taíno chieftains—Caonabó, Guacanagarí, and Guarionex—and a Taíno youth Columbus captures, Spain’s Queen Isabella and King Ferdinand, and Columbus himself. 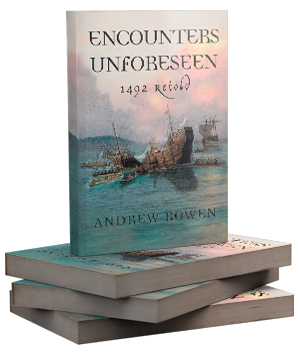 It depicts the education, loves and marriages, and other life experiences each brought to the unforeseen encounters and then their astonishment, fears, and objectives in 1492 and 1493. The focus includes the Taíno “discovery” of Europe, when Columbus hauls the captive and other Taínos back to Spain, as well as the chieftains’ reactions to the abusive garrison of seamen Columbus leaves behind in the Caribbean. Throughout, the Taíno protagonists are neither merely victims nor statistics, but personalities and actors comparable to the Europeans, and their side of the story is forcefully told. Rowen weaves a fascinating tapestry of scenes and dialogues from the historical record. Isabella plots her dynastic marriage, argues with Ferdinand over who’s supreme, and wages war to expand their kingdoms. The chieftains take multiple wives to consolidate their rules, vie to marry the beautiful Anacaona, and battle Caribe raiders. An unknown Columbus conceives a fanciful voyage, marries advantageously to promote it, and yet suffers an agonizing decade of ridicule and rejection. Guacanagarí rescues Columbus when the Santa María sinks, but Caonabó questions Guacanagarí’s generosity, and Guarionex is vexed, having witnessed a religious prophecy of Taíno genocide inflicted by a “clothed people.” Columbus teaches his captive Christianity, initiating the following centuries’ collision of Christianity with Native American religions and spirits. The novel’s Taíno stories depict both events known to have occurred (e.g., the chieftains’ ascensions to power, the prophecy of genocide, the captive’s baptism in Spain) and known practices or experiences (e.g., hunting, inter-island canoe travel, a hurricane, a Caribe wife raid, a batey game). The Isabella and Ferdinand stories include their establishment of the Inquisition, subjugation and Christianization of the Canary Islands, completion of the Reconquista, and expulsion of the Jews from Spain, illustrating European doctrines of conquest, enslavement, and involuntary conversion and how the sovereigns ruled over Old World peoples before encountering Native Americans. The Columbus stories portray his pre-1492 sailing experiences and the evolution of his world outlook, and his thoughts during the encounters embody the concepts underlying the European subjugation of Native Americans over the following centuries. Stark societal differences are illustrated, with the Europeans practicing slavery and the Taínos sharing food as communal property. The narrative carefully dramatizes conversations that Columbus or Bartolomé de Las Casas indicate occurred, including by illustrating the conversations’ ambiguous nature owing to the absence of a common language. Romantic interpretations are eschewed—that the captive admired his captors (he constantly contemplated escape) or that love preceded any of the fifteenth-century marriages shown—but historical judgments regarding the participants are left for the reader. The stories often incorporate text from primary sources. A Sources section provides citations and briefly discusses interpretations of historians, anthropologists, and others contrary to the author’s presentation, as well as issues of academic disagreement. Encounters Unforeseen reflects some historical information infrequently focused on, such as: the identity of all the Taínos taken to Europe and their known survival and activities; and the Taíno chieftains’ encounters with the Pinta’s crew, which arrives in Haiti/the Dominican Republic prior to Columbus. The novel also integrates African themes and events, relating the contemporaneous commencement of European African slave trading.